I am more of an optimist than a pessimist, but I am even more of a realist. For I am certain that it is more a case of when not if there is another financial crash on the horizon. Some may think I am going all Harry Dent here predicting doom and gloom, but when you look back through history it is plain to see, it is just a matter of time. 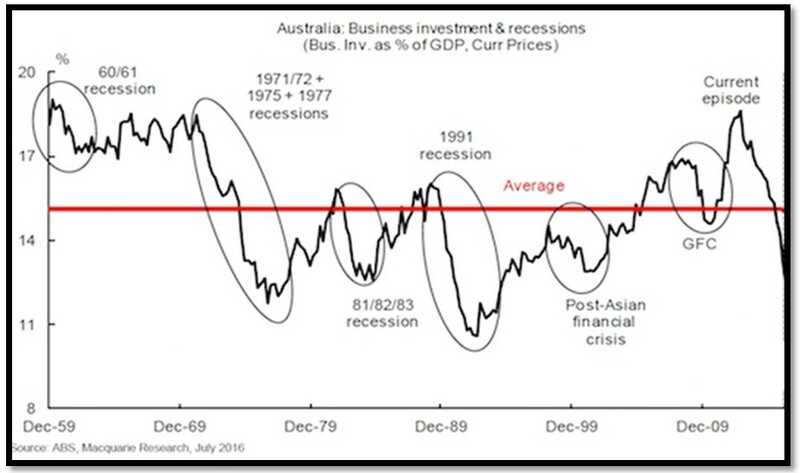 While the graph above concerns business investment in Australia, for me it highlights the timeline and frequency of downturns in Australia and just how common they have been. There was a recession in the 1960’s, 70’s, 80’s,90’s and the most recent being the Asian Crisis and GFC in 2000’s – do you see a pattern here? So far from making a bold statement, all I am doing is suggesting that history will repeat itself some time over the next decade as it has done for the last 5 decades. As a property professional, part of my plan and my clients’ strategy is to plan for these type of scenarios – risk management. 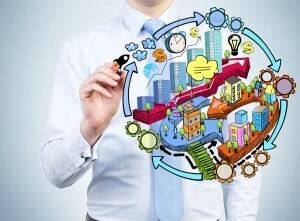 You need to futureproof your next investment property. There are many things to consider here, but I would strongly suggest analysing how the suburb you are considering investing in has performed over the last few decades. We want to understand how the suburb has performed over many property cycles, we are looking for above average capital growth. What happens during a recession or downturn? The first point is fairly obvious and something many investors would naturally look for. However, I feel point 2 is as important if not more important. The two suburbs above are both suburbs in the state of Queensland. While one suburb lost 35.6% in the GFC of 2008/09, the other state only contracted a mere 2.2%. The first suburb does not have the employment hubs, jobs growth and demand for property and is likely to be a strong investor market where investors have to sell in a crisis. The second suburb clearly has more stability, jobs growth, demand for property and would have a higher owner occupier percentage, that are willing to ride these times out and do not have to sell. The result is plain to see as they are polar opposites. This is the most important risk management strategy for successful investors. It is not just to prepare for a financial downturn, but you should also have a buffer to allow for health issues, job losses or other unforeseen circumstances. 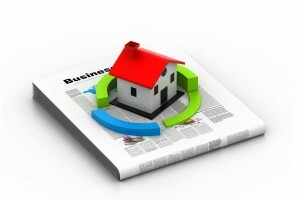 A financial buffer should allow you to hold your properties for 3 – 5 years. Should you have a period where you are unable to earn an income, a financial buffer will allow you to get through that time without having to sell down your portfolio. The power of compounding is very important, selling a property breaks the chain and forces you to take a step backwards. You lose that momentum and are up for agent’s fees and charges, along with any capital gain. The secret to having a financial buffer is to be prepared. Some investors make the mistake of waiting for the crash or crisis before seeking further funds to add to their buffer. Financial institutions are often reluctant to lend and credit access is even more difficult during a crisis. You should therefor look to keep your buffers topped up every couple of years when credit is relatively easier to access. While the possibility of a financial crash sends a shiver through many investors. Professional investors realise it is part and parcel of investing and like everything else is cyclical in nature. They also learn to prepare and mitigate the risks so they can escape these phases of the cycle relatively unharmed. In many cases they also put themselves in a position to pounce and thrive while others fall by the wayside during these times. They ensure they are future proofing their portfolios with superior assets and keeping their buffers topped up with funds readily available. These crashes are not nearly as frightening if you are prepared and have a portfolio with the right type of assets.